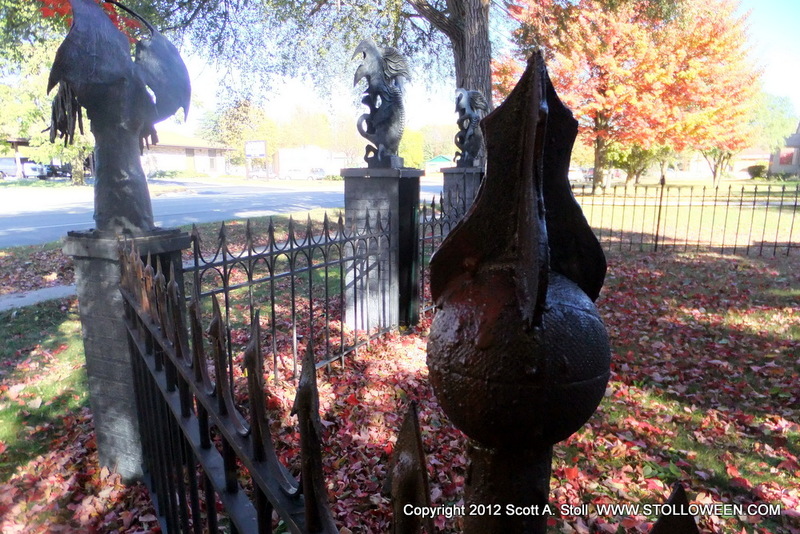 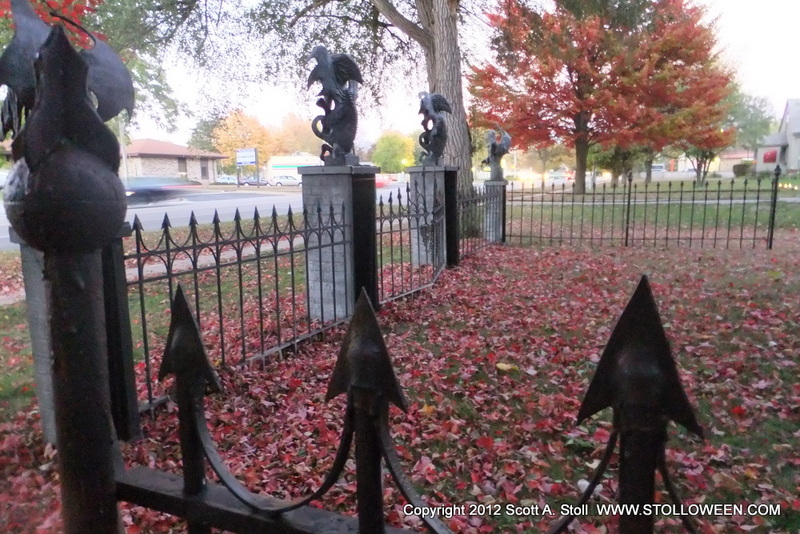 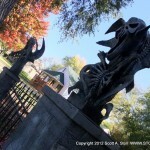 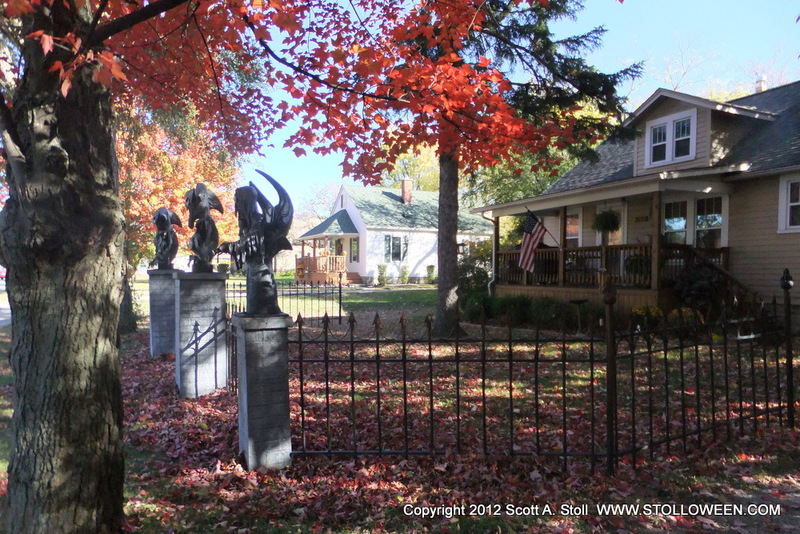 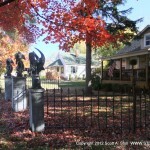 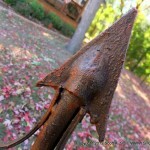 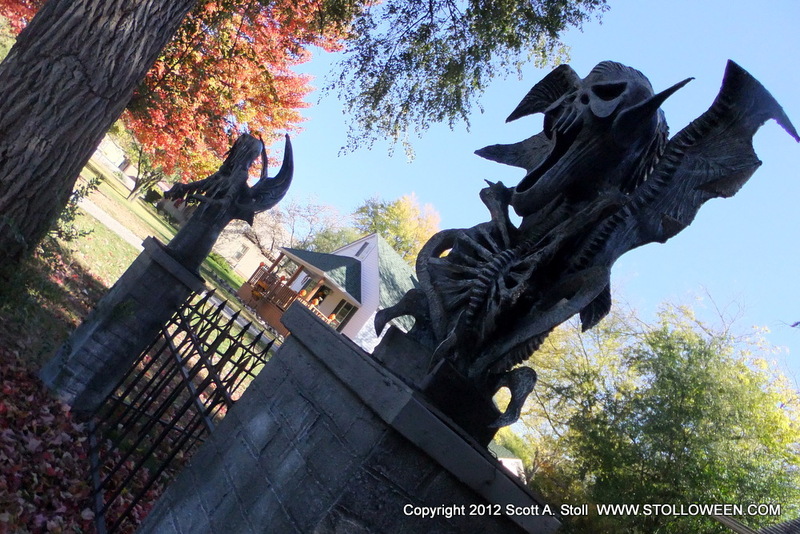 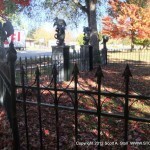 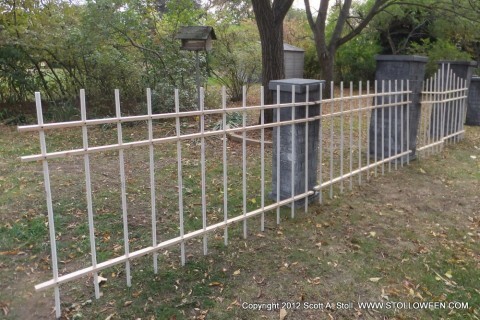 For many years our yard display used a dilapidated wood fence as the backdrop for our Halloween display. 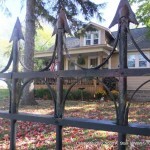 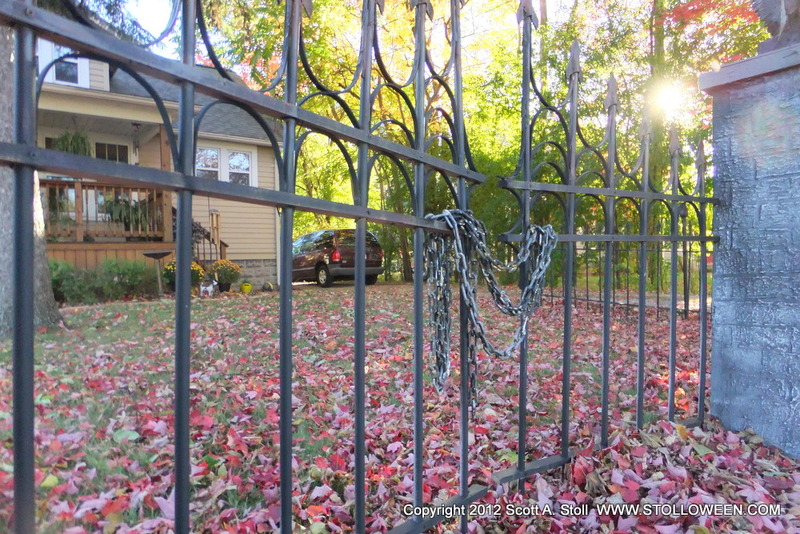 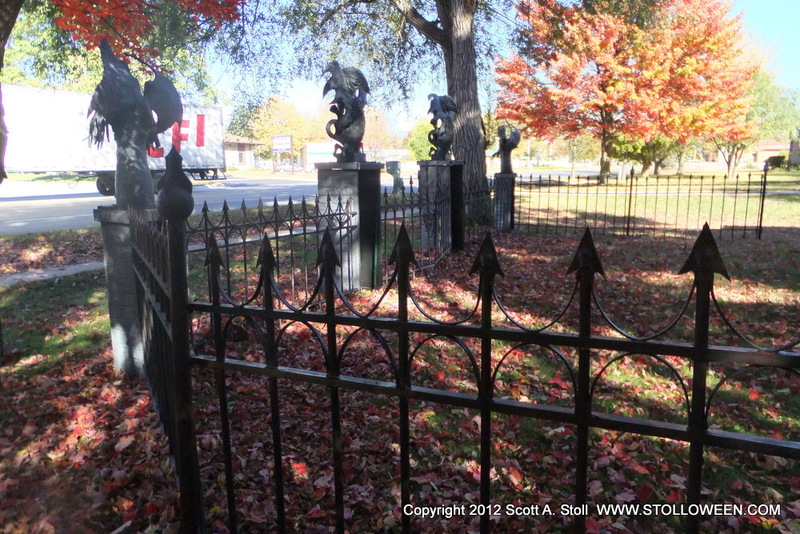 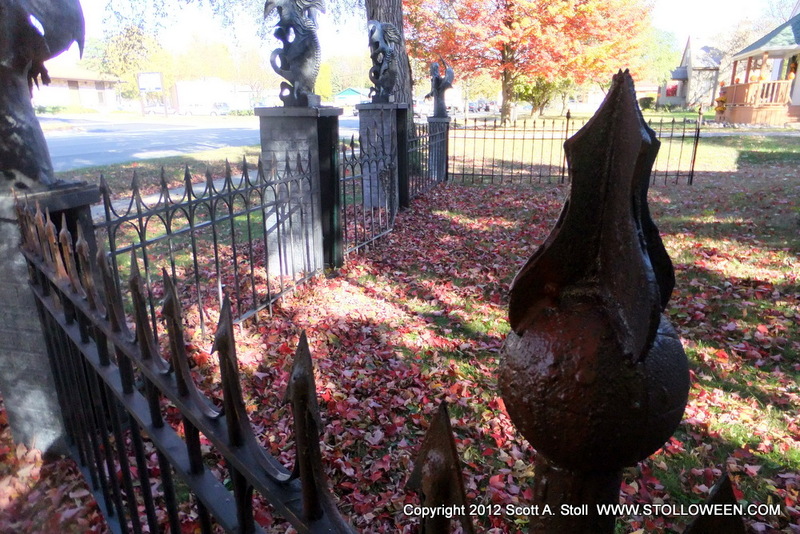 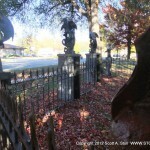 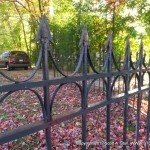 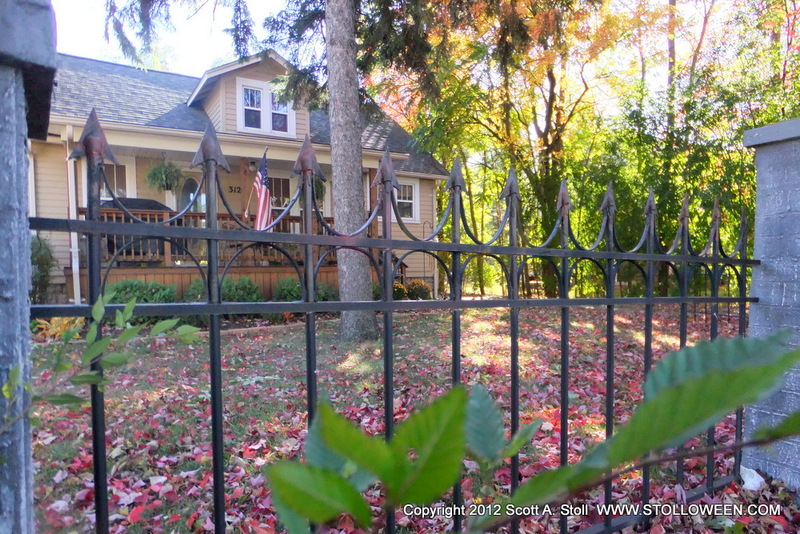 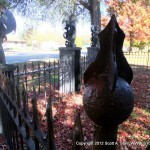 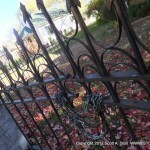 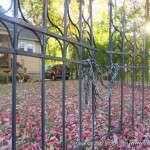 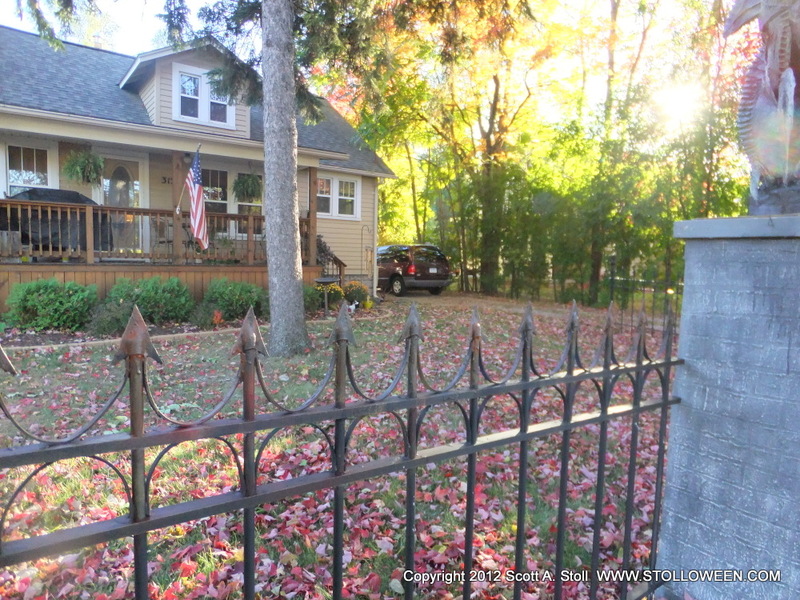 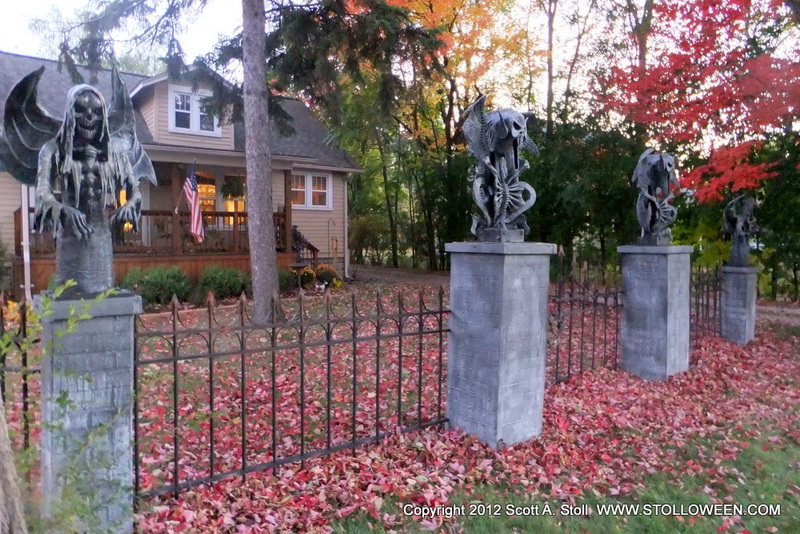 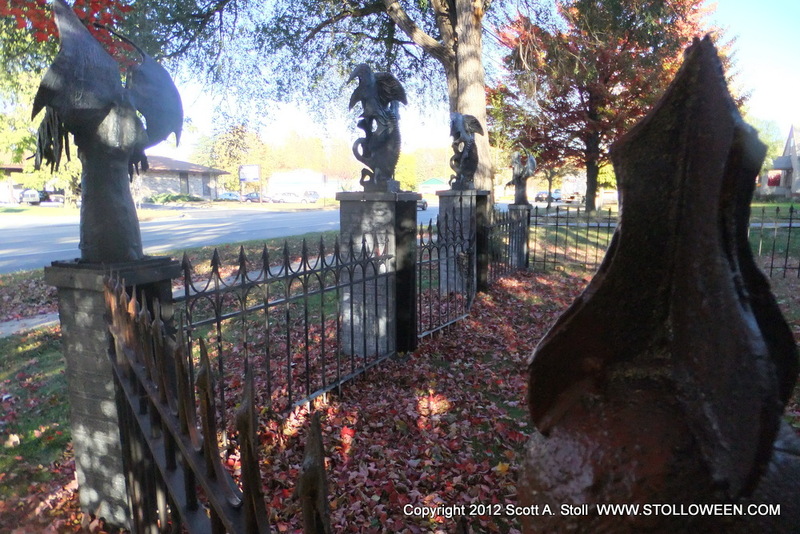 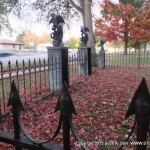 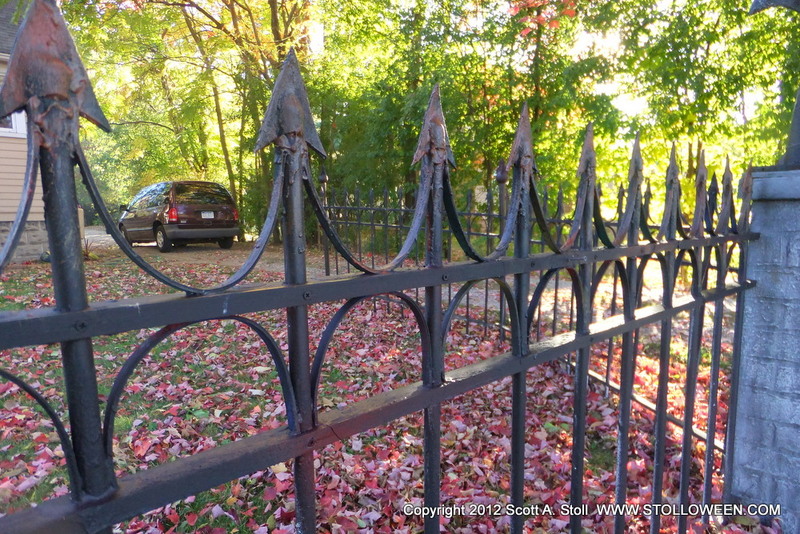 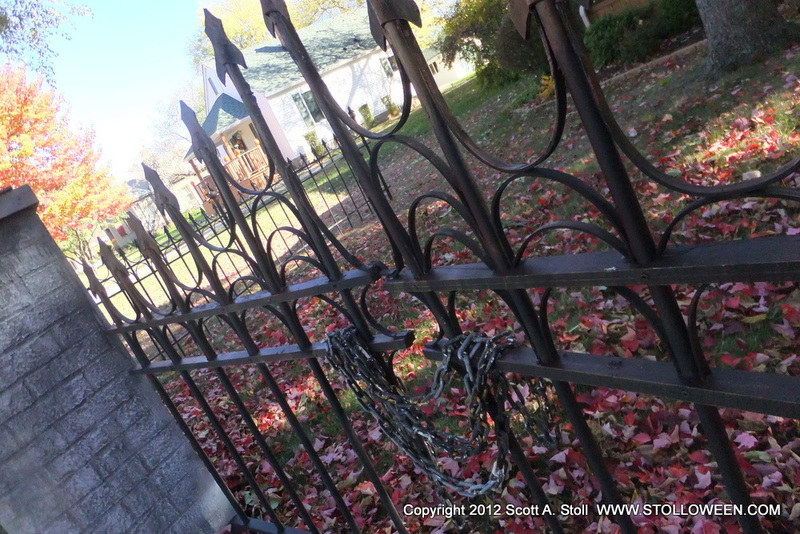 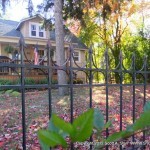 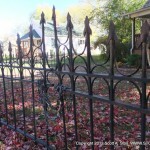 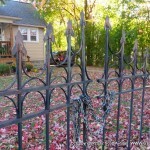 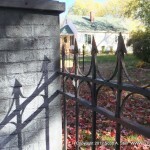 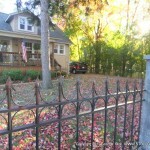 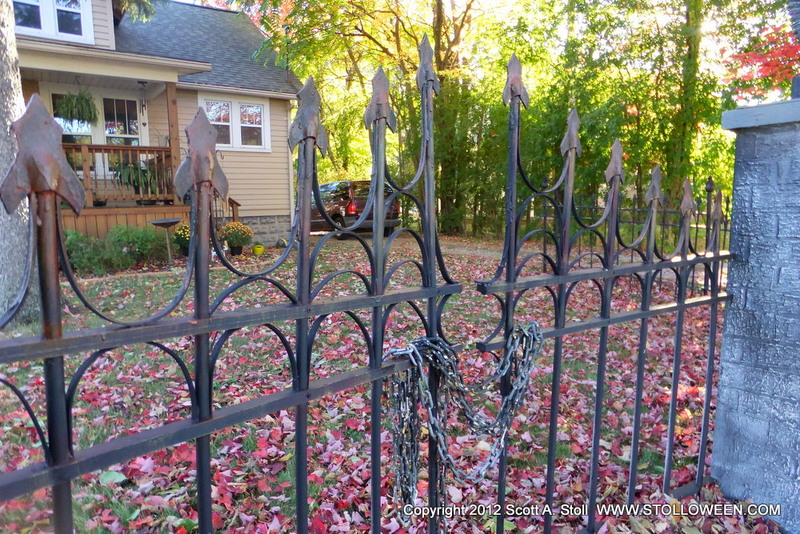 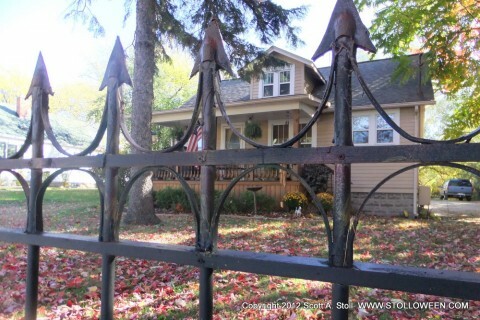 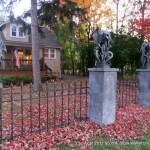 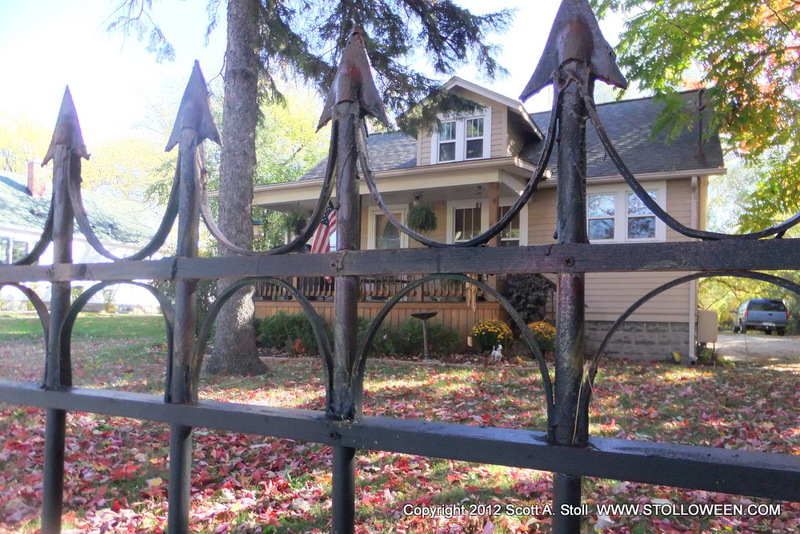 The old fence was adequate but could definitely be improved, so for 2012 it was decided that the majority of our Halloween “budget” would be used to create some faux wrought iron fence. 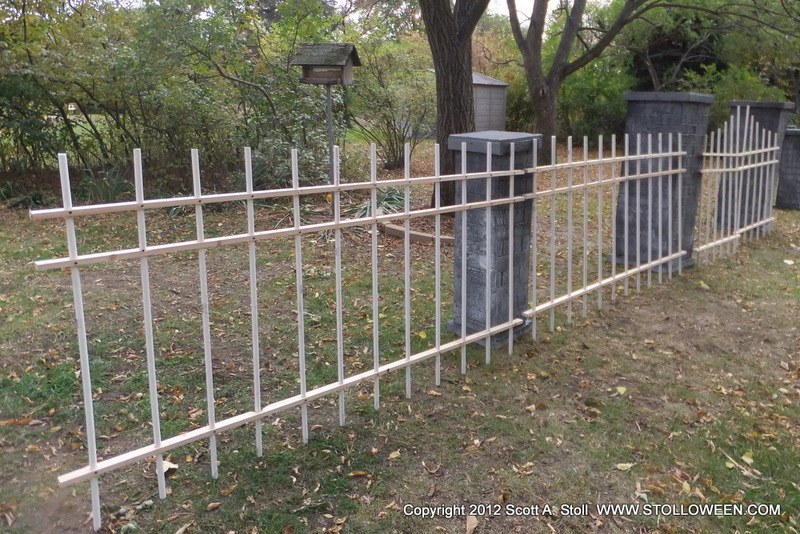 The fence is made from 1×2 inch pieces of lumber, ½ inch PVC pipe and sheets of craft foam. 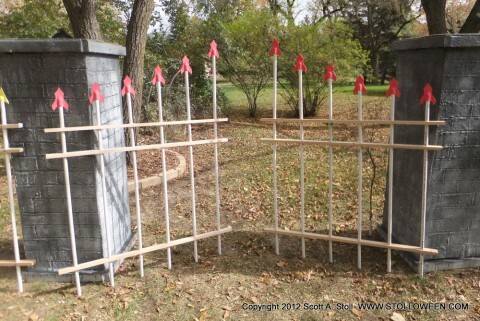 Thank you to all the haunters that have posted tutorials on making cemetery fences because your instructions were a great source of inspiration and knowledge. 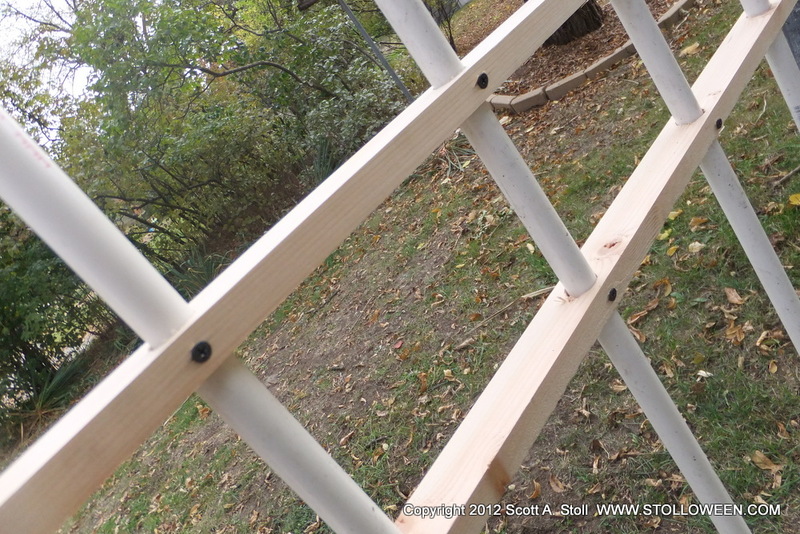 The horizontal part of the fence was created from 8 foot sections of 1”x2” boards. 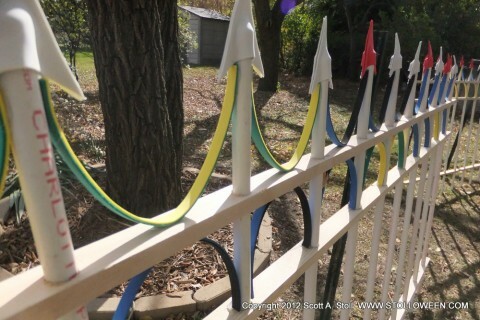 The vertical rungs were made from ½ inch PVC each four feet long. The design for my fence required the PVC pipe to be spaced every eight inches which meant that each eight foot section of fence would have 12 pieces of PVC. 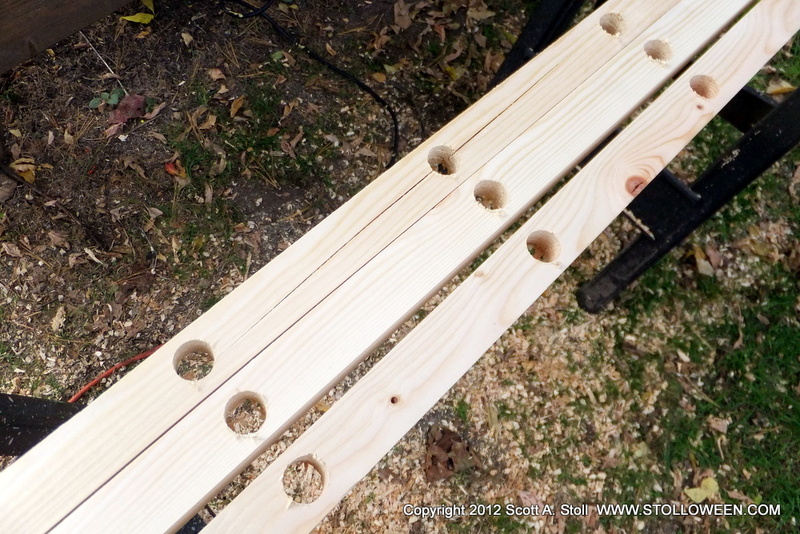 A 7/8th inch speed boar was used to drill the holes in the wood, once the first board had the holes bored it was used as a template for the other boards. 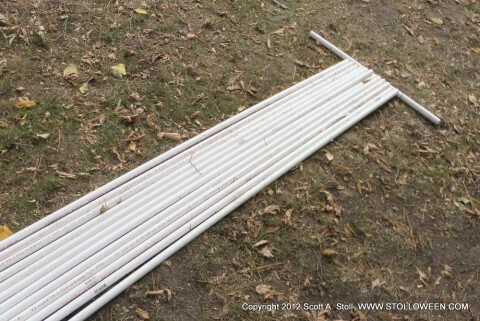 The PVC pipe was cut into four foot long sections using a PVC pipe cutting tool. The PVC sections were then threaded through the holes in the boards and a 1-1/8th inch drywall screw was used to secure the PVC. 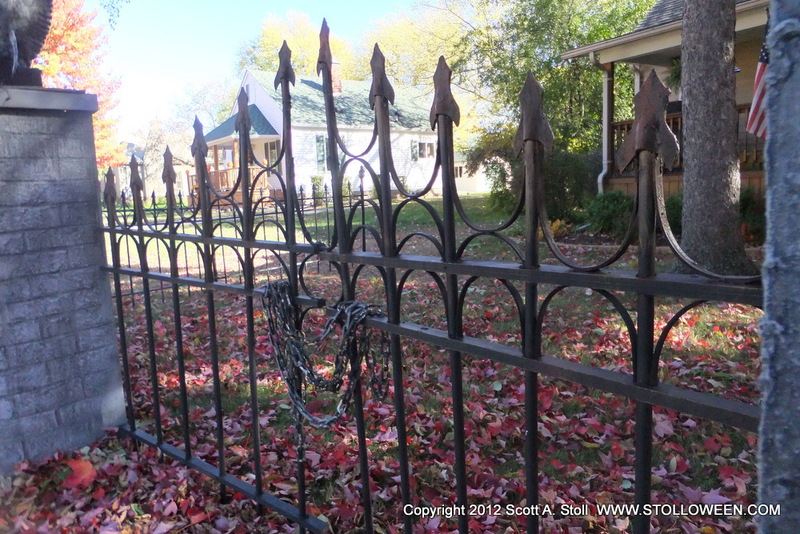 Now that the main structure of the fence is complete it’s time to get creative and make the finials and ornate curved iron sections. Most tutorials relied on purchasing fence finials from supply companies and while this is a great idea I had neither the time nor budget for this approach. 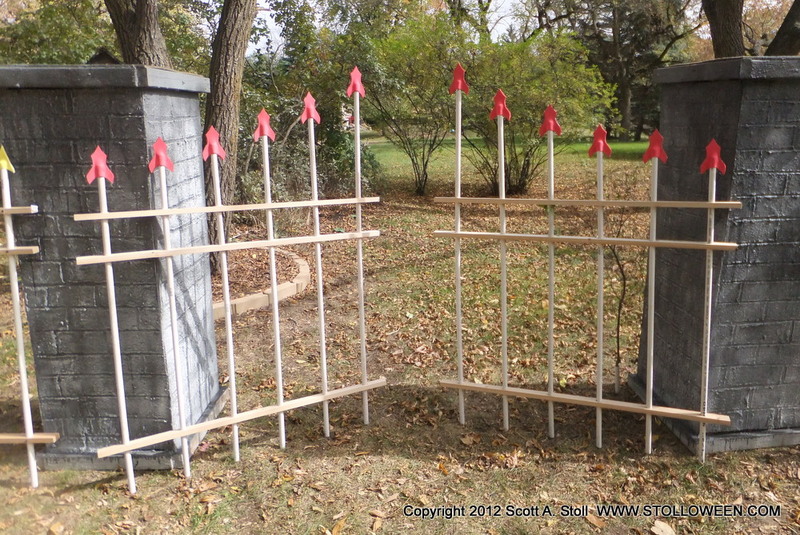 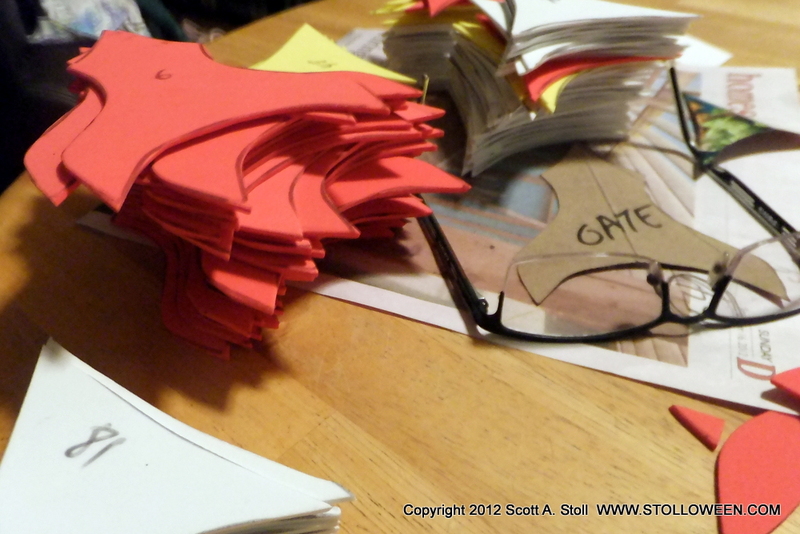 My solution was to make the decorative sections of the fence from sheets of craft foam. 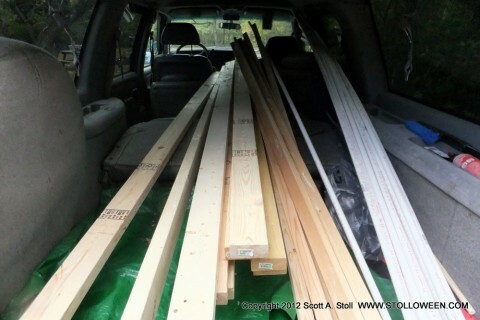 Craft foam can purchased from art and craft stores as well as the craft section of larger department stores. For my project I used multi-color sheets of foam but if possible I would suggest using only black foam because it will eliminate a lot of work (and grief) when it comes to painting the fence. 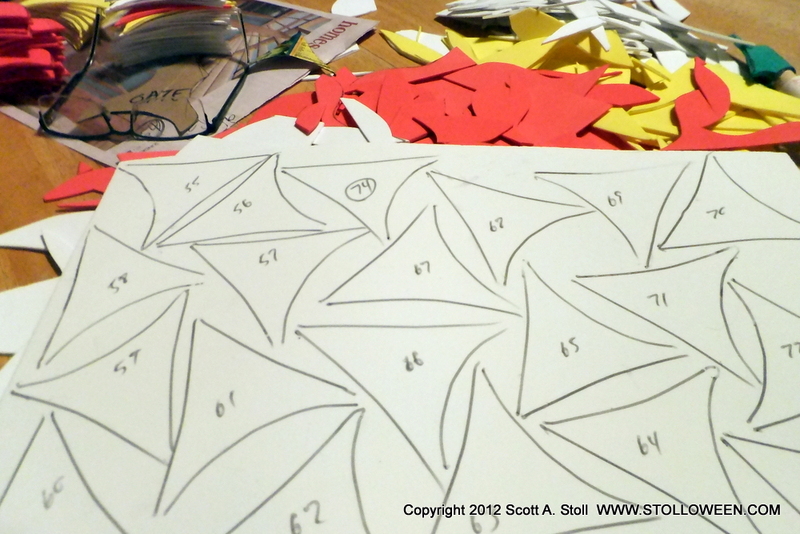 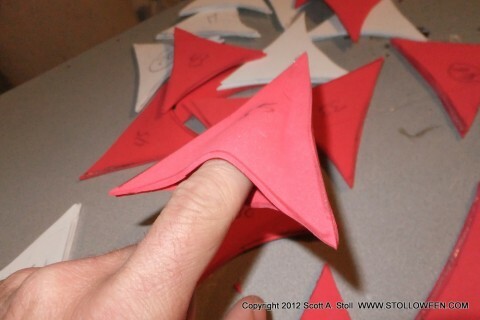 First design the shape of your finial and cut the pattern out of a thin piece of cardboard. 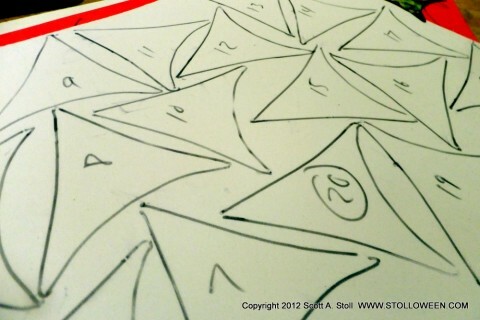 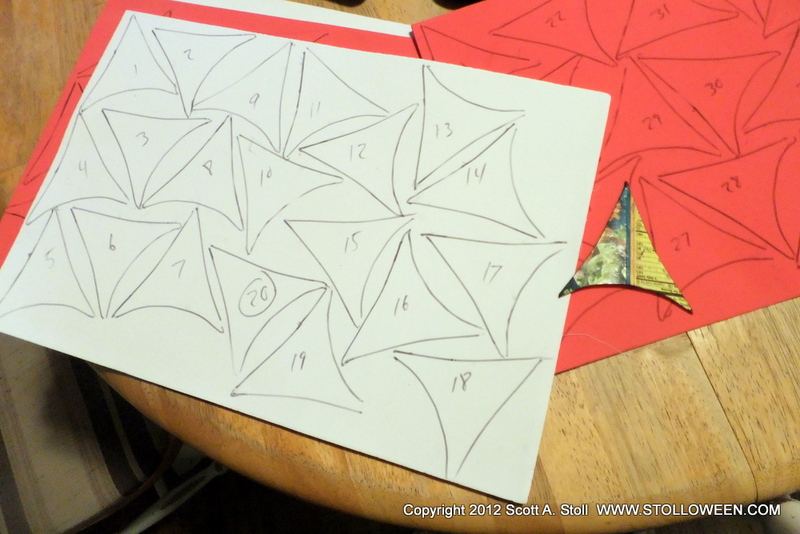 Use the cardboard pattern to trace the shapes onto a sheet of foam. 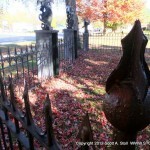 You will need two foam pieces for each finial. 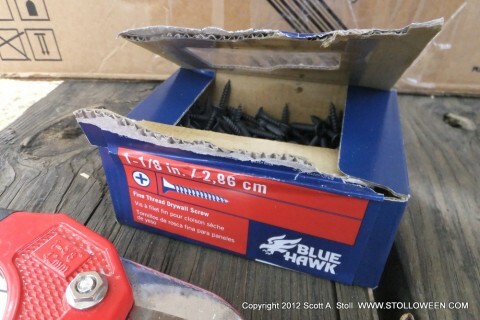 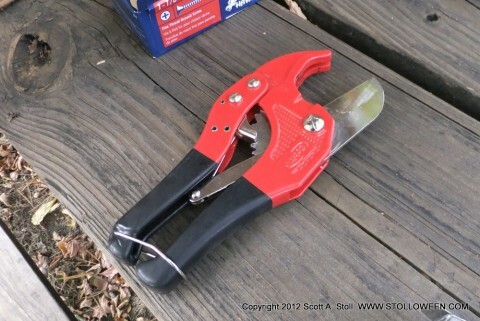 A hot glue gun was used to glue the foam finials together, only glue the sides and the top leaving the bottom unglued so that it can be slid over the PVC pipe. 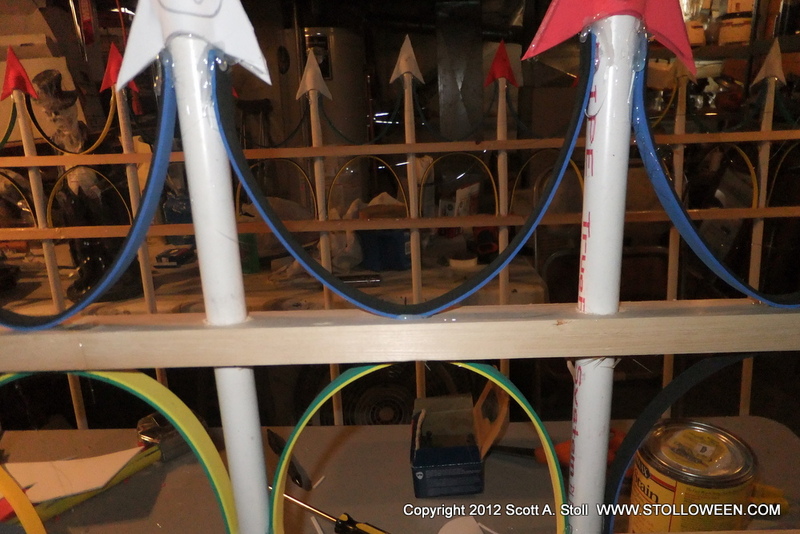 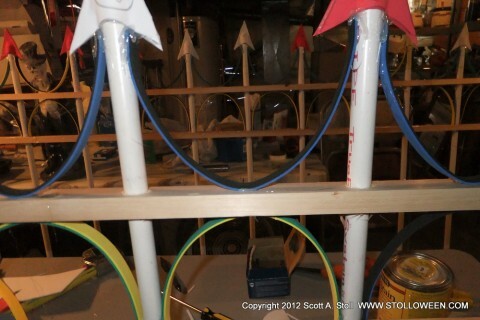 Once the hot glue has cooled the foam finials can be slipped onto the top of the PVC pipes. 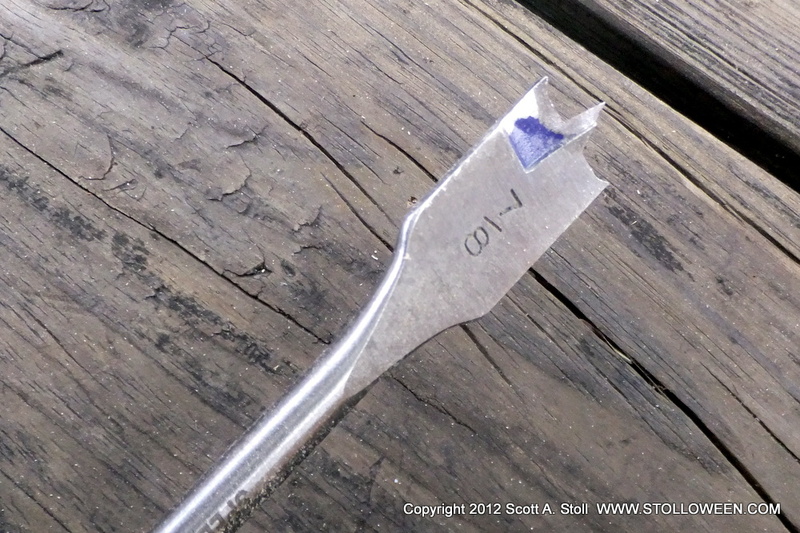 Additional hot glue is then used to secure the finial to the plastic pipe. 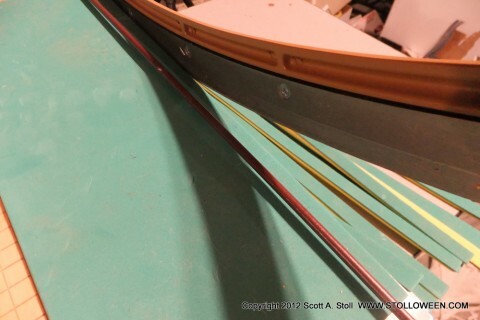 The curved iron sections were made by gluing two sheets of foam together to increase the thickness and then cutting the foam into ½” strips. The ½” strips are hot glued to the wood and PVC to create an ornate design. 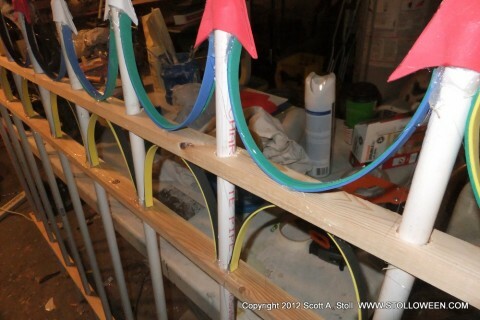 Once all the foam work has been added the fence can now be painted. 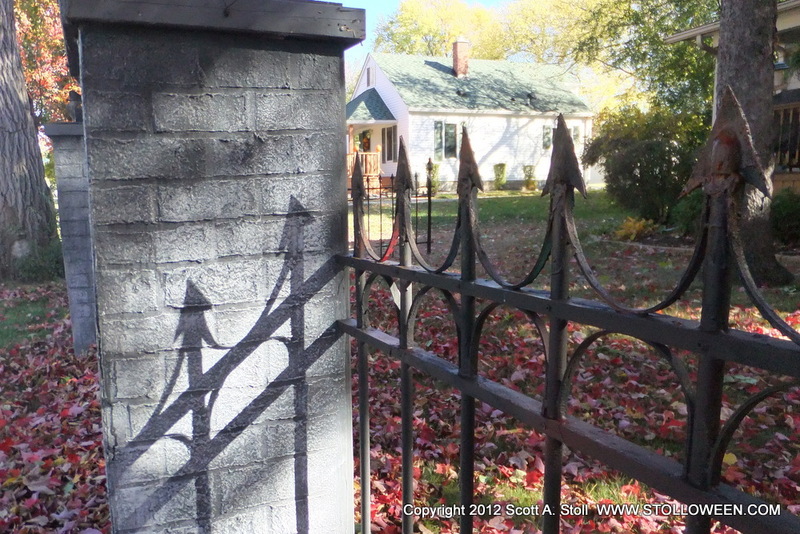 First the entire fence was painted black using exterior black latex paint; next I added sand to some black latex paint and generously applied it to the finials and random sections of the fence to add a rough texture that would simulate rust when the proper color is applied. 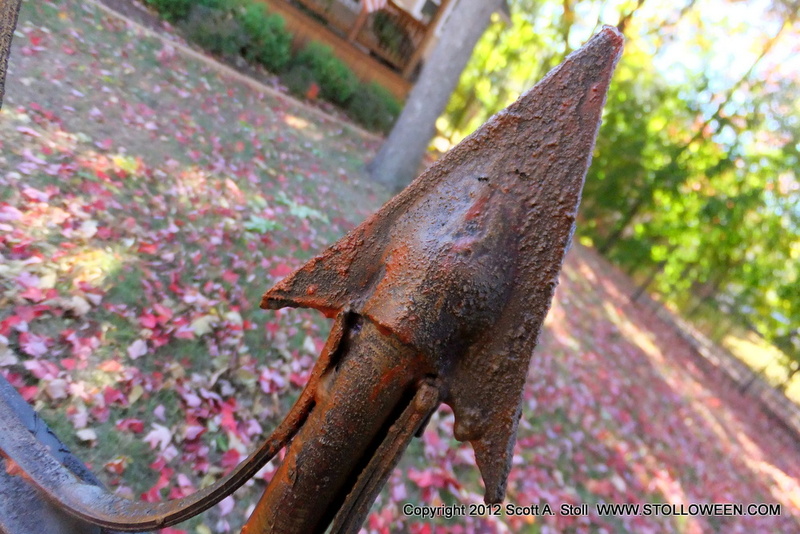 After the black paint as completely dried a variety of different colors such as brown, red and orange were dry brushed over the black paint. The final step was to add some antique maple gel stain to the dry brushed areas accentuating the rust effect.